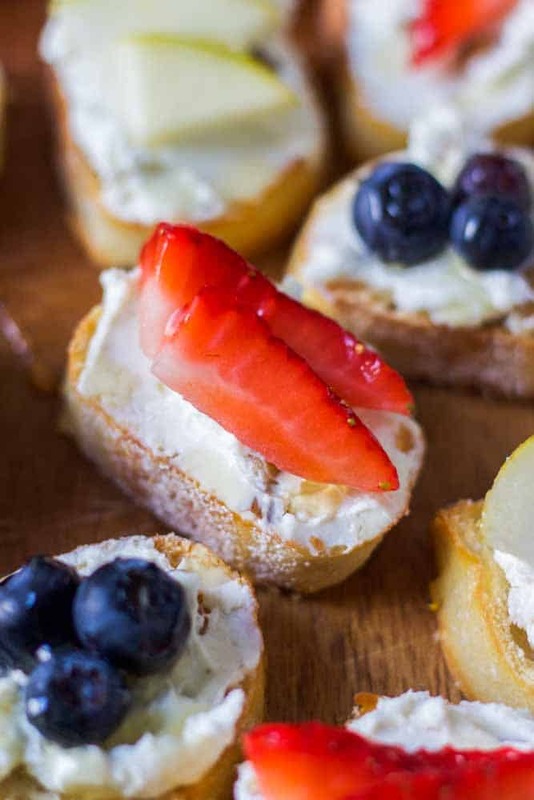 These adorable (and delicious) bite-size crostini slices are so easy to make and pack so much flavor! They make the perfect addition to any brunch spread and can be whipped up in minutes. Here’s the truth: once you pop one of these bad boys in your mouth you will not be able to stop. And why would you want to? 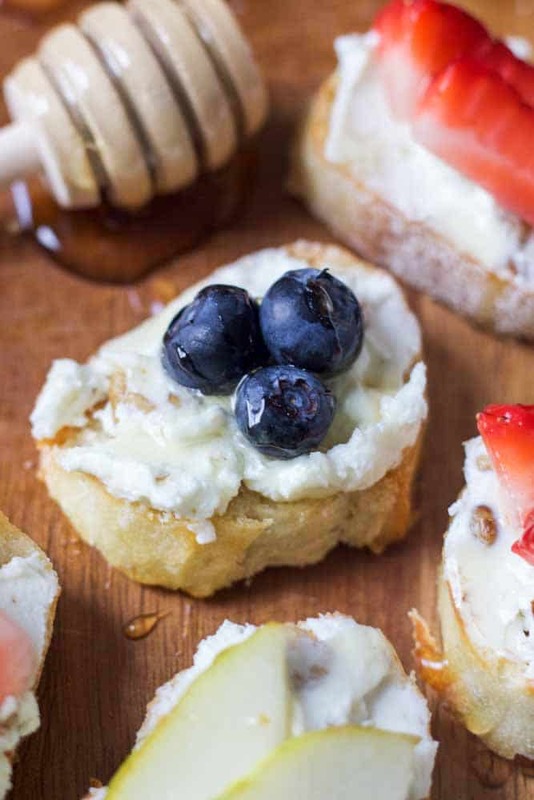 They’re like little bites of spring on a toasty piece of bread. And they will likely be on your brunch menu—which makes them that much better. Because brunch is everything. And then some. 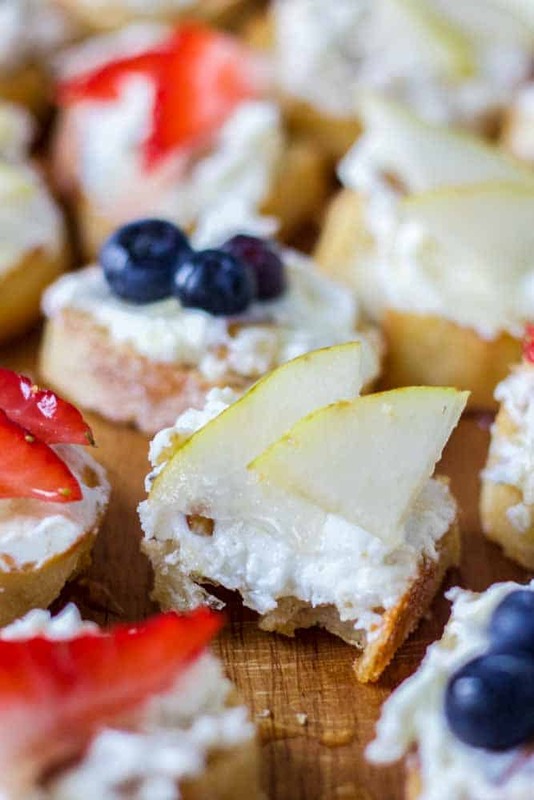 What you’re getting today is the light and slightly sweet goat cheese, just the right amount of crunch from the walnuts and a burst of fresh fruit. All on top of a crusty piece of bread. A.K.A a crostini. Cuz we’re fancy like that. I recently hosted a Premier Jewelry Party and a portion of the benefits wen to Girls on the Run (yay!!). Shameless plug: it’s an awesome, wonderful, inspiring organization that helps young girls learn about confidence, being unique and leadership all through physical activity. SO, to please all the lovely ladies that came to the party and donated their hard earned money to this great cause, I headed to the grocery store to make the crostini. 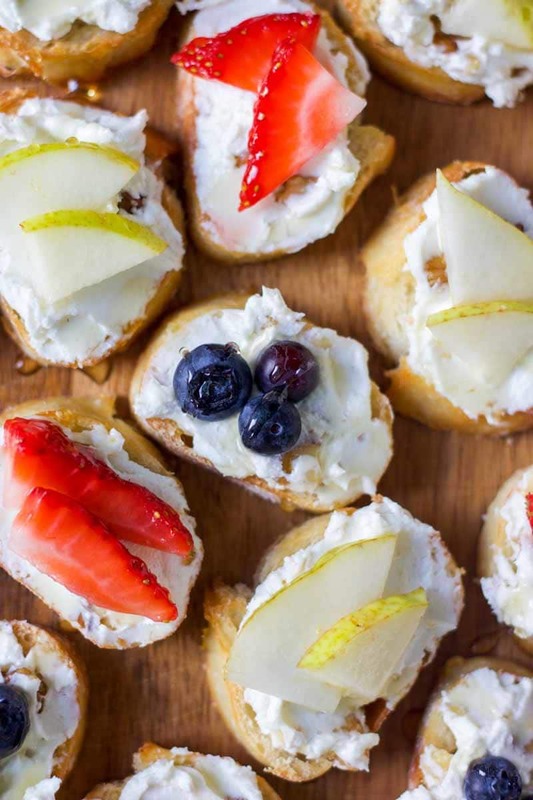 I got myself a french baguette, goat cheese, honey, walnuts, fresh fruit and basil and whipped these up to take to the party. And I have no doubt they will be a hit at your Mother’s Day brunch. If you bring these I promise you people will oooh and ahhh over them because they sound super fancy but they’re a cinch to make. 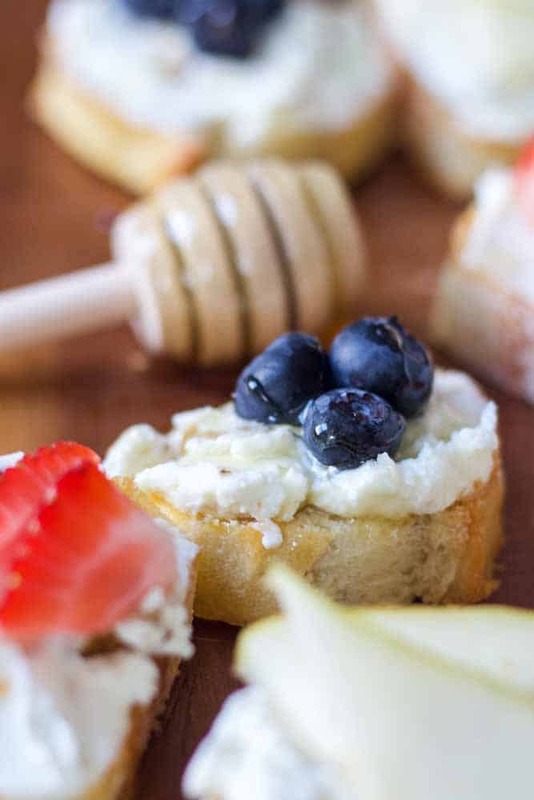 You toast the bread in the oven and while it’s cooking you whip goat cheese with honey, mix in walnut and slice your fruit. When the oven clock dings you spread your goat cheese mixture all over the crusty bread and top with the fruit. Drizzle slightly with honey and top with basil if desired and BOOM. The best, most fresh, and easy brunch recipe or dessert. *You can use whatever fruit you like best! Preheat oven to 350 and bake for 10 minutes, until lightly toasted. You may need to turn the broiler on for the last minute or two to get the golden color. Using a hand mixer, whip the goat cheese with honey, about 2 minutes. Add chopped walnuts and mix until combined. When bread is done, allow to cool slightly. Spread about 1 tablespoon of goat cheee and honey mixture on each piece of bread. Top with fruit. 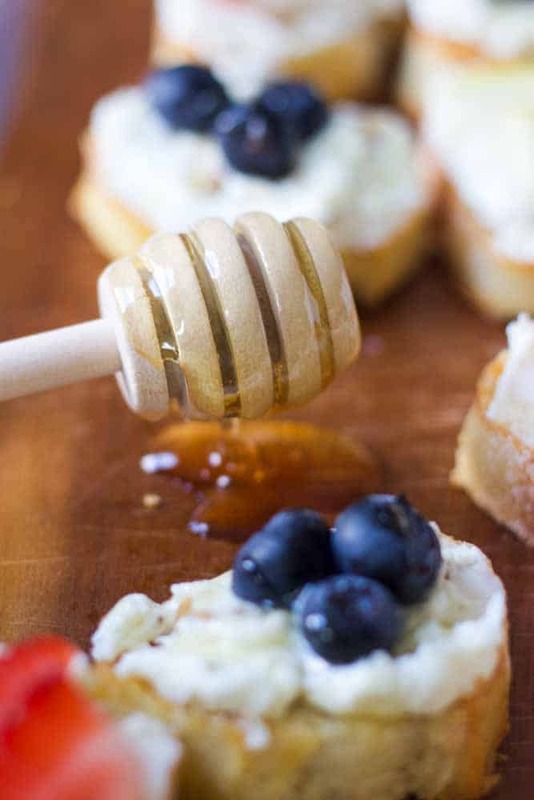 Drizzle with honey and top with basil if desired right before serving. Keep in an airtight container int he refrigerator for up to two days. love crostini’s! 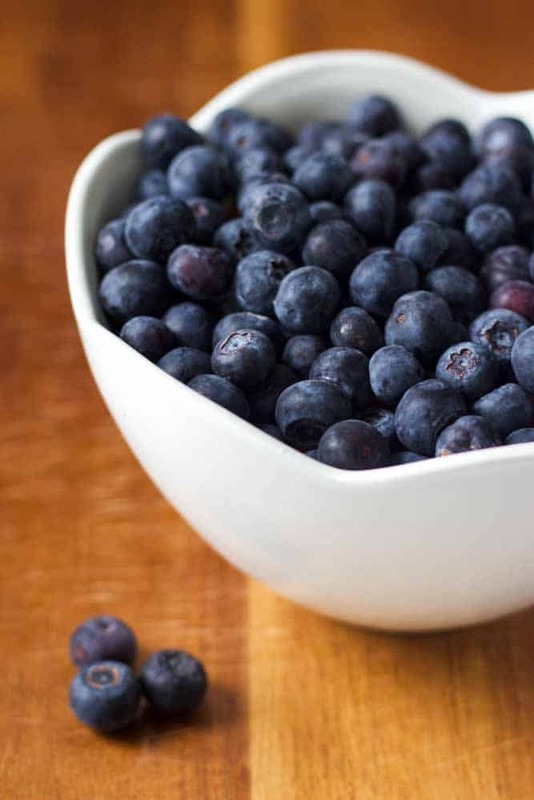 especially sweet and healthy ones like these. they look like the perfect little snacks.